The only thing that could make this picture of Kroy and Kim happier is if she decided to change her last name to Zolciak-Biermann after their million dollar wedding. The newly-born Kash Kade Biermann joins older brother Kroy Jagger “KJ” Biermann, and is now part of one of the best-named families ever (though it still pales in comparison to Bob Geldof’s children’s names) and the illustrious “fraternity of people who are lucky their last name doesn’t start with K”. Welcome to the world, Kash! In the “Stuff that Somehow Escaped Our Olympic Coverage” department, we bring you Shin A-Lam, from the North Korean Olympic team. Unsurprisingly, information on Mr. A-Lam (or Mr. Shin? I need to brush up on my Korean) is sparse, due to, you know, a couple of dudes named Kim and their autocratic personalities. Speaking of dudes named Kim, we also managed to miss Kim Yoo-Suk despite constant requests from our readers. Many mea culpas. Perhaps we doo suk. Luckily, there’s a bit more info on him since he’s from South Korea and has competed in the Olympics before. Finally, in the “Clarifying Sexual Preferences of Deceased Interplanetary Pioneers” category, America’s first female astronaut, the recently-deceased Sally Ride, came out due to some subtle wording in her obituary mentioning “Tam O’Shaughnessy, her partner of 27 years.” Hopefully we’re moving past the point where that is shocking anymore, but what is shocking is how awesomely-named Sally’s partner and sister are. Presbyterian minister Bear Ride, aka Sally’s sister, confirmed that Tam was, indeed part of the family. We’re pleased to introduce Tam and Bear as part of the Funny Names Hall of Fame family as well. Our condolences and best wishes for them during a difficult time period. This entry was posted in Funny Names In The News. Bookmark the permalink. First thought to my mind was Cash Cow…interesting. Haha, that’s not too far off. Dave!! Guess what was playing on the radio when I woke up this morning? Chumbawumba. Nothing to do with today’s edition of FNITN, I know, but I thought you’d appreciate it. Of course I appreciate it! Thanks for letting me know. Danbert Nobacon is one of my favorite people on the planet, I think. 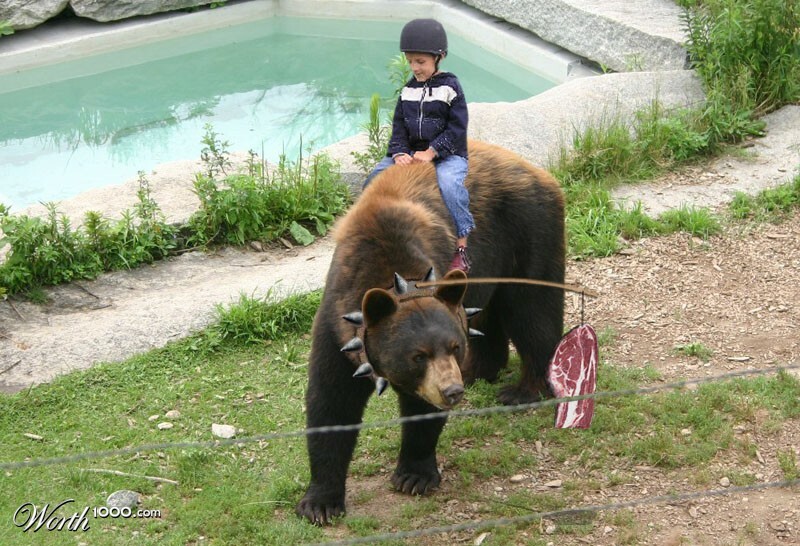 Love a good bear ride. Almost as much as a literal photo of a funny name. Thanks Becky! I spent about 21 minutes on this post, so just two “ha”‘s would have been appreciated, but 9 is tremendous! I’m glad you enjoyed it! Yay! Thank you. I agree. If someone doesn’t like funny names, they done got serious issues!